Digital display pressure gauge for portable use in pharmaceutical measurement applications, capable of measuring 0 to 60 psi g pressure with 0.5% accuracy and connected using a triclamp fitting. Also includes a 0-10Vdc output, hygienic fitting and cal cert. A combined digital readout unit and pressure transducer for portable use to measure pharmaceutical product pressure over 0 to 60 pounds per square inch gauge to an accuracy better than 0.5%. This DS 200P pharmaceutical digital pressure gauge and transducer is powered by an internal battery and is connected to the physical pressure measurement point using a triclamp hygienic process fitting. Accessible external M12 connections are provided to connect external power and the 0 to 10 volts dc analog output for sending pressure readings to other nearby instrumentation. The extra capability of a hygienic triclamp fitting and food grade oil fill is incorporated into this digital pressure gauge to make it suitable for pharmaceutical applications. 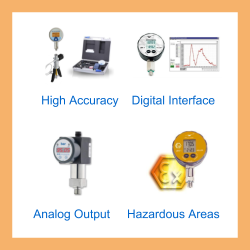 To meet applicable quality assurance regulatory requirements, a calibration certificate is supplied with this digital pressure gauge. 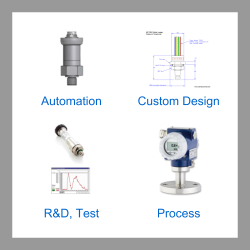 Please complete form below to request a quote for 60psig range pharmaceutical pressure gauge and 0-10Vdc transducer with triclamp fitting. 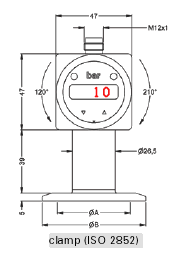 Send us your enquiry for 60psig range pharmaceutical pressure gauge and 0-10Vdc transducer with triclamp fitting to get assistance with this product type.